Women's Boutique steps from the sand in Downtown Manhattan Beach. Women's clothing + accessories store located in Downtown Manhattan Beach. Men’s, Women’s, Children… something for everyone can be found in Downtown Manhattan Beach. 70's-inspired California lifestyle Brand. Mens, Womens Kids + Swim. Men's + Women's + Children’s Contemporary Beach Apparel, Accessories + Footwear. Purpose-built surf apparel and accessories made by hand in Santa Ana, CA since 1961. An upscale women’s boutique featuring contemporary designer accessories + clothing. Two locations. Opened in 1979, with an emphasis on stylish all-natural fiber clothing made in America. Dreams are made of Sun, Sand + Bikinis. Located in Downtown Manhattan Beach. High-end Fashion Boutique showcasing well-known brands and emerging fashion trends. Give your wardrobe a makeover with pre-loved apparel and accessories. Women's apparel + accessories located in Downtown Manhattan Beach. Apparel, Accessories, Shoes, Free People Collection, Intimately Free People. What inspires us to live a life filled with color, beauty, style, comfort, friendships, family + passion. An upscale women's clothing boutique. Handmade + locally produced. On trend active wear, boho style dresses, tops, bottoms and outerwear from all parts of the world. Women's Clothing, Accessories, Gifts in Downtown Manhattan Beach. Cutest beach boutique. Women's fashion, shoes + accessories in Downtown Manhattan Beach. Heavenly Couture specializes in offering the highest quality merchandise in all of its selection. Fashion retailer stocking trendy clothing & accessories for young women. LuLu’s Nouvelle is a charming boutique bringing a little bit of European luxury to Manhattan Beach. 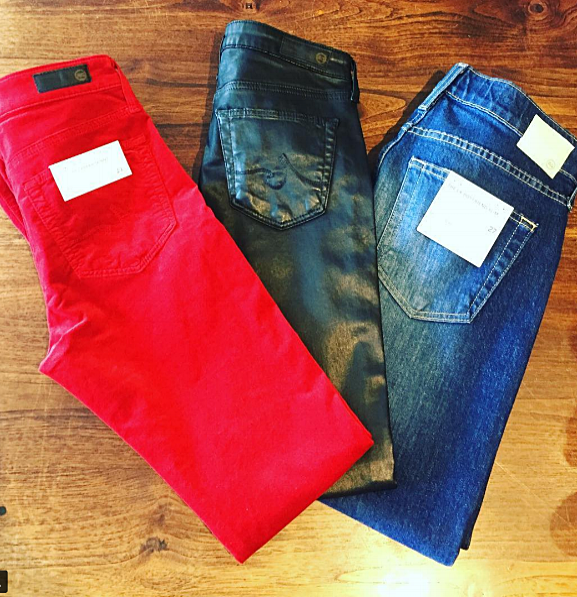 Manhattan Denim is the South Bay's only Destination Denim store. Jewelry Parlour for Men + Women Located in Downtown Manhattan Beach. Clothing, Fashion, Knitwear, Cashmere, Footwear, Jewelry, Leather Goods. Lorna Jane is the home of Active Living. Live your best active life through Move, Nourish, Believe. T-shirts, clothes and Saturdays not spent working. Women's Apparel. Women's fashion that offers affordable luxury with beach chic. We're a funky little Waterman Shop in the heart of Manhattan Beach. Creative Studio. Handmade Leather Goods, Found Objects + Home Decor. All you need is love and shoes. We are located in Manhattan Beach, CA. Est. 1994. We ship! We're barefoot with the windows down along the Great Ocean Road. Clothing + accessories for the surf, skate + snow lifestyle in Downtown Manhattan Beach. Massage + Skin + Body + Clothing + Jewelry + Party Venue + Boutique. Escape on the rooftop oasis. A women's + baby boutique carrying clothing, accessories + gifts. Est. 1992. Manhattan Beach, California. We bring footwear to the world. Optimistic fashion inspired by Los Angeles, Palm Springs, California + beyond. Preppy clothing, for men, women + kids. Every day should feel this good. Women's clothing, accessories, handbags, shoes, jewelry, home decor + gift items. Designer Jewelry + Accessories - Handbags - Shoes - Men's Styles - Clothing + More. It's not just about what you wear, it's about what gets you up in the morning. We offer latest clothes, shoes, + accessories from California beach towns. A new perspective on performance apparel. Breaking down boundaries of activewear. Wright's fuses a culture of American tribal craft + modern bohemian style. If you are looking for women's fashion is Los Angeles, Downtown Manhattan Beach is your shopping destination. Downtown Manhattan Beach is home to many women's apparel, fashion designers + fashion jewelry entrepreneurs who offer their stunning creations in the fashion boutiques as well as independent jewelry stores. Contemporary designer clothing, everything to master the casual California coastal chic look, fashion swimwear, boho chic boutiques, and the perfect all-day athletic-wear.From timeless opulence, precious stones, and stunning fabrics, a complete look for all occasions can be bought off-the-rack or custom-made just for you. Come see why Downtown Manhattan Beach is the premier women's shopping spot in the South Bay.